Cattle producers in several counties in southern, northern, central, and northeastern Oklahoma have been devastated by wildfires in the last ten days. Two separate fires in Payne County have charred over 8,000 acres and have laid waste to about 20 homes and more than 100 outbuildings. County officials are still assessing the damage and say the total number of buildings lost is expected to push higher. Nathan Anderson, OSU Extension Specialist for Payne County said several producers that he knows of have been severely impacted by the drought and the wildfires on top of it. He said some ranchers have lost almost everything, but surviving cattle are now without feed. He said some producers are electing to sell their remaining livestock because the wildfires not only destroyed any remaining pasture they had, but in many cases they destroyed barns and hay supplies. Another problem confronting producers, Anderson said, is that fences have been destroyed across wide swaths of the area. What remains of multiple herds have been comingling, necessitating the ranchers to attempt to sort through them and reclaim their stock. Anderson said some producers don’t have anywhere to take their cattle because their barns, corrals, and fences are now gone. He said the dire need producers have at the moment is for feed for their livestock, but there are no local supplies no significant surplus supplies in surrounding states. If there's any good that can come out of the destruction, Anderson said, it is that these fires highlight the need to control and eradicate the Western red cedars which are prevalent all across the state. He said they burn so quickly with such a tremendous amount of heat that fire spreads through them far faster than firefighters can keep up. 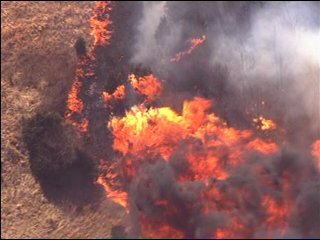 He said he hopes these fires will serve to awaken Oklahomans to control and eradicate the fire-prone trees. You can hear more from Nathan Anderson by clicking on the LISTEN BAR below. Nathan Anderson reviews devastation, hurdles faced by ranchers after wildfire.